As Halloween approaches (only 1 week left guys! ), I want to share a tutorial that uses very basic materials and is relatively quick and simple. 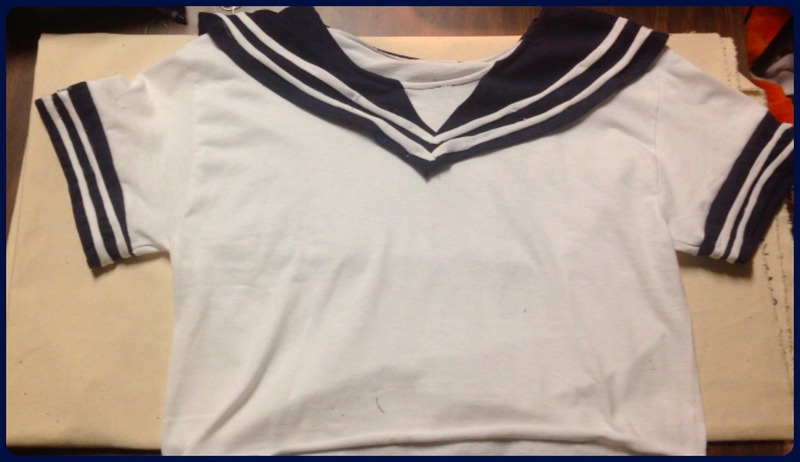 This sailor girl uniform only requires two tshirts; no super fancy fabrics or materials required! 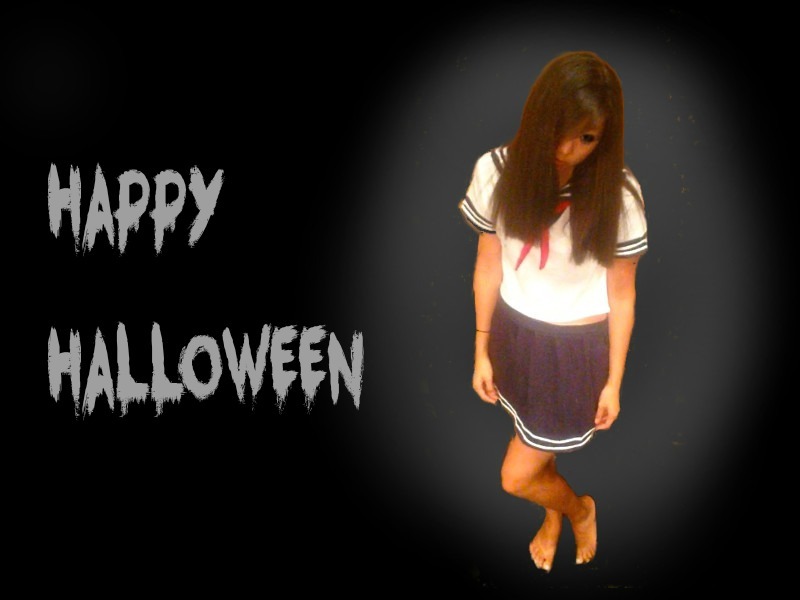 You can make this a cute and girly costume, or you can unleash your inner Japanese horror movie, Grudge-style schoolgirl. 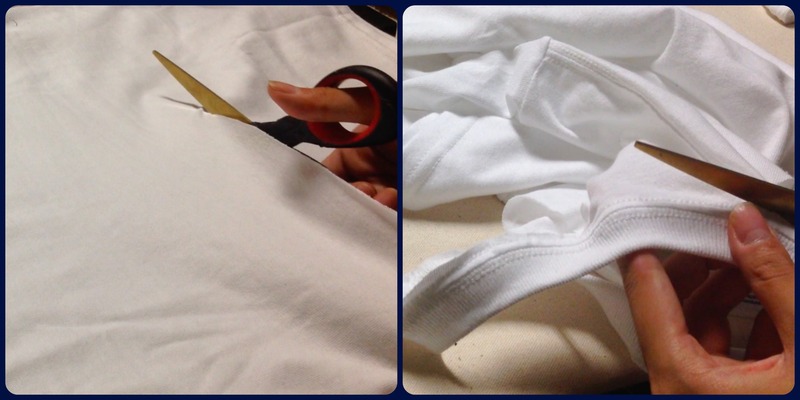 Making the entire uniform from only two tshirts allows you to use some convenient short-cuts, and it saves you money! I got my tshirts for $2.50 each from Michael’s. 1. Crop the shirt by cutting off about 6 inches at the bottom. For a detailed tutorial on shirt cropping, check out my previous post. Don’t throw away the cut off part! You’re going to need it later. You’ll notice that the navy parts of the uniform have double white stripes. To make these stripes, you’re going to use the leftover part of your white shirt. 1. From the shirt bottom, cut out a strip of white fabric about 1 inch wide. 2. Snip one loop so that you have a single flat strip. 3. Pull on the strip so that the edges curl downward. 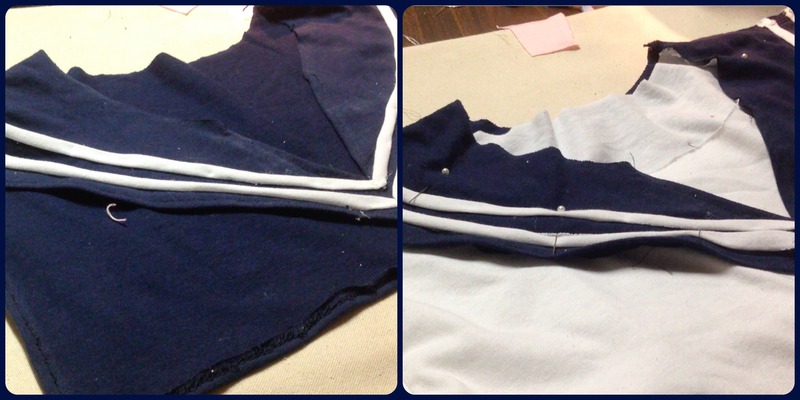 You can then sew or glue this strip onto the navy pieces to create stripes! Every sailor girl needs a cute collar! We’re going to use the original shape of the other T-shirt to make things a little easier. 1. Because the two shirts are different sizes, trace an outline of the white shirt onto the navy shirt. Make sure the collars are lined up. 2. Following this outline, draw two triangles for the sailor collar. 3. Trace the shirt onto the back of the navy shirt and draw a rectangle for the back of the collar. This should connect to the front collar piece. 4. Cut around the chalk lines, leaving a bit of room for hemming purposes. 5. Fold down the raw edges and hem using a straight stitch. 6. Glue or sew double the double white stripes you made before all around the edge of the collar. 7. Pin the collar to the top of the shirt, making sure that the raw edges line up. Fold the raw edges down inside the shirt, and sew all around. 1. Taking your navy shirt, cut 3 inch sections off the ends of the sleeves. You’ll be attaching these to your white shirt. 2. Because the navy shirt is larger, you’ll want to compare the navy sleeve to the white sleeve. Mark where the white sleeve ends on the navy sleeve. 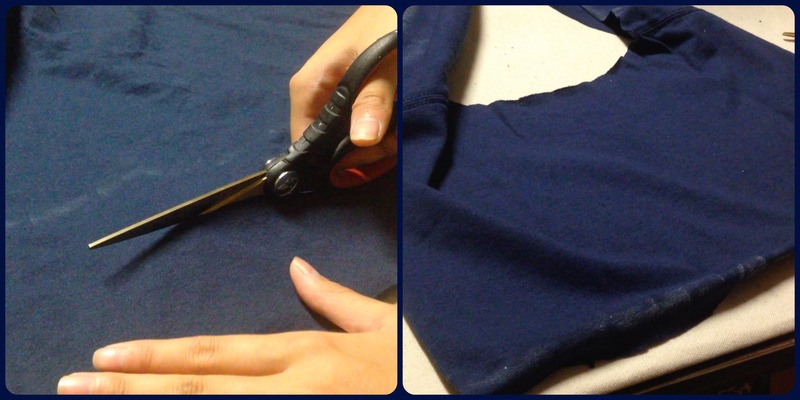 Turn the navy sleeve inside out and sew straight along the marking. The sleeves should now be the same size. 3. Add the double white stripes. 4. Trim 3 inches off the ends of the white shirt sleeves. 5. Pin the navy shirt sleeves to the white sleeves, right sides facing inwards. Sew all around. We’ll be using the remainder of the fabric for the skirt! 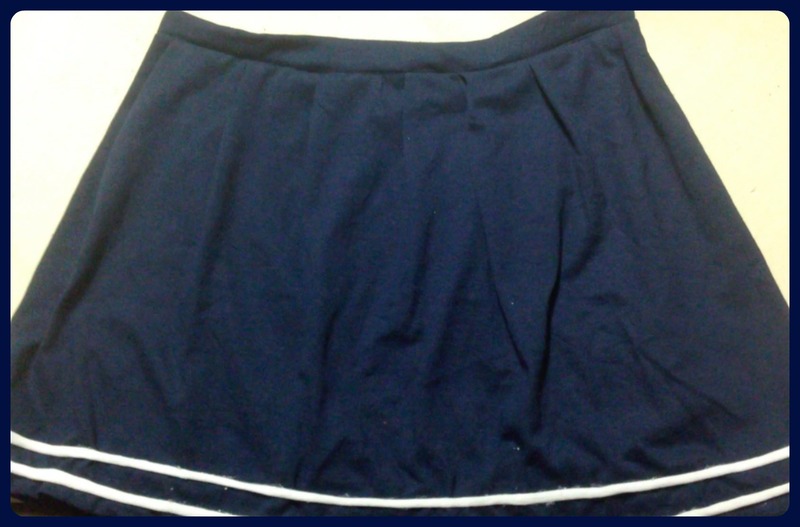 The skirt is made out of the remainder of your navy t-shirt. Because t-shirt material is stretchy, the skirt can be slipped on without a zipper. If you feel that 1 shirt may not be wide enough, then sew together the bottoms of 2 shirts to double the skirt size. 1. Trim off the uneven edges of your navy shirt so you have one large rectangular piece. Slip this on and mark where you want the waistband to sit. 2. Following your marking, cut out a strip of fabric. This will later be your waistband. 3. Add double white stripes to the bottom of the skirt. Every schoolgirl skirt needs pleats! 1. Pinch 1 inch sections of the fabric and fold to the left. Pin in place. Continue to this around the edge of the skirt. 2. Take the waistband piece you made early and trim it so it fits the pleated skirt. Sew down the edge so you have one continuous piece of fabric. Attach the waistband to the top of the skirt, right sides facing together. 3. Sew down the waistband using a straight stitch. 4. Fold the raw edge of the waistband down and pin. Sew around where you previously stitched to secure the waistband. 1. Cut out a 24 in strip of red fabric that tapers at the ends along a fold. 2. Sew right sides facing together using a straight stitch (make sure to leave a gap!) and then turn right side out. 3. Close the gap using a blind stitch. I hope you guys have a lot of fun making and wearing this costume! For more costumes, check out my Hershey Kiss Costume and Totoro Beanie! This is fabulous!!!! What a great idea! And great timing for me. I am making a white T shirt with red detail. I wish I’d read your blog first. But nevermind……I will buy a red T shirt to finish it off!!! Your outfit looks great. Let me know how your shirt turns out! So kawaiii! 😀 ❤ you, halicopter. Been watching and keeping tabs on all of your content! I loved your YouTube video of this tutorial, even thou it’s no longer viewable. Thank goodness for the written version. Update – Wanted to let you know that I removed the copyrighted material in the video and Youtube has it viewable again!